The Council’s bankers are Lloyds TSB, Westminster House Branch, Dean Stanley Street, London, SW1P 3HU. Its Independent Examiners are Mr J D Cheesman and Mr R J Wallis. At the close of the Annual General Meeting on 29th May 2006 the Council’s membership comprised 7 Life Members, 22 Honorary Members and 204 Representative Members representing 66 affiliated societies. Since then one affiliated society has been dissolved, thus losing two Representative Members; 1 Life Member has died; 6 Honorary Members retired and 5 who had been elected at that meeting took office; one Representative Member has died and the vacancy has been filled and there have been five other changes in representation. Subject to any further changes, at the start of the 2007 Council meeting there will be 6 Life Members, 21 Honorary Members and 202 Representative Members. The work of the Council in pursuing this object is for the most part carried out by its seventeen committees and by working groups appointed by them. Summaries of their activities during 2006 are given in the committee reports, which appear elsewhere on the Council’s agenda and are being published in the 27th April 2007 issue of The Ringing World. The Accounts for 2006 show Total Funds at the year end of £358,577, of which £184,908 is in Restricted Funds. The income for the year totalled £33,366, compared with £59,239 in 2005. The Trustees have the power to invest money and adopt such measures as seem to them necessary in the interest of the Council. They do not have any power to borrow money. It is confirmed that the Council’s Assets, together with the expected income for 2007, are available and are likely to be adequate to fulfil the object of the Council in that year. (v) Library Fund - the balance represents the value of the library which is maintained for use by council members and affiliated societies. (vi) Publications Fund - the balance represents the stock of publications held and a cash balance to facilitate the production of new titles and the reprinting of existing publications. Funds are invested in low risk investments and bank deposit accounts. The need for regular income from investments is considered important to support the work of the Council. The Capital Fund has been redesignated as General Fund since the purpose of the Capital Fund is no longer required. The Library committee expenses have been paid from the General Fund instead of a grant from the General fund to the Library Fund. The General Fund is unrestricted. The Education Courses Fund and Publications Fund are designated Funds. The Bell Restoration Fund, F Dukes International Bell Fund and the Library Fund are maintained for restricted purposes. £54,181 has been transferred from the Capital Fund to the General Fund. The major tangible assets of the Council are the Investments in National Savings Income Bonds, the Fred Dukes International Bell Fund, which is invested in a CAF Bank Limited Gold Account and the Library Collection. The Library Collection is valued at a replacement cost of £65,733. The revaluation was undertaken by J M Farringdon as at December 2003 when the value was £67,600. The policy is to revalue the collection every five years. It is being depreciated for accounting purposes at 2% per annum. An asset register is maintained for other tangible assets. The policy is to treat assets of an individual cost up to £1,000 as fully depreciated in the year of purchase. The major intangible asset of the Council is the copyright of Dove’s Guide. The Fred Dukes International Bell Fund awarded three grants totalling £3,671. One grant awarded in 2005 was not taken up and there were no payments during the year. The Bell Restoration Fund did not award any grants in 2006. A total of 17 grants totalling £12,220 were paid in the year. The General Fund made one grant in 2006 of £1,145 to All Saints, Fourways Gardens, Johannesburg which was the amount collected through an appeal in The Ringing World. There were unfulfilled charitable commitments at 31st December 2006 in respect of 4 grants totalling £5,946 awarded but not yet paid by the Fred Dukes International Bell Fund, and 20 grants totalling £17,900 awarded but not yet paid by the Bell Restoration Fund. Storage and distribution cost of £1,800 was paid to Council members. Due to other commitments there has been little activity in respect of the Carter Ringing Machine. The Stewards have ensured that the Machine and the associated display work are kept in good order in the main body of the Museum. There have been no requests for demonstrations from Ringing or other Societies. Following a request from the last Council Meeting in respect of the Peter Cummins Simulators we report that all items remain in the same condition as when received at the Museum in 2002. The items have not been operated since that date (and possibly before) with the exception of item 8 from the list below which was last in use at the Roadshow in 2005 at Newbury. Model bell in wooden frame with fittings - 510mm x 310mm x 410mm. Aluminium box - 350mm x 230mm x 130mm. Item 8a - chipboard base hardboard top - 700mm x 350mm x 350mm. Item 8b - chipboard box - 600mm x 500mm x 150mm. Item 8c - dark brown box - 600mm x 500mm x 150mm. Item 12a, mk III - chipboard base with triangular aluminium superstructure, hardboard cover missing - 690mm x 330mm x 280mm. Item 12b - chipboard box - 530mm x 470mmx 150mm. Additional items for item 12a. Two small boxes containing programme cards - 240mm x 180mm x 80mm. Three foot pedal switches. Folder containing a set of construction and operation details for simulators. There are two additional items a) A 37 note keyboard with Music Rack 760mm x 300mm x 130mm and b) a unit 760mm x 610mm x 180mm with a 180mm diameter loud speaker. I have received a very small number of names to be added to the Rolls of Honour. If any members of Council have further names for inclusion, will they please submit them to me by the time of the Council meeting. I will arrange for an update to the books after the meeting. I will report further on the availability of hard copy and/or electronic versions of the Rolls at the meeting. Since the 2006 Council meeting the Committee has met twice in London, in October and March. The arrangements for the 2007 Council meeting were discussed and agreed; the Committee has continued its practice of reviewing the work of Council Committees and received presentations from the Education and Library Committees. Council website - the ICT Committee recommended that Dove’s Guide remain under the current basic hosting contract with Nildram and that the Council and related websites be moved to the Servelocity Virtual Private Server. It was explained that John Baldwin and his colleagues felt that to move away from Nildram would not maintain the existing levels of service for Dove. The change was agreed. It was noted that the Public Relations Committee was working alongside the ICT Committee to improve the front page of the website, to make it more appealing to non-ringers. Ringing Roadshow - this item was discussed by the Committee since the General Fund provides financial support if needed. The Public Relations Committee had considered several sites: Stoneleigh had been visited on 20th July by Committee members and the President: they were impressed by the facilities available. John Anderson had been invited to organise the show. There was much discussion on whether to hold a two-day event: it was agreed that such an event could take place on a Friday and Saturday, NOT a Saturday and Sunday; extending the hours of opening on a Saturday was not practical, as people still had to travel home; a preview late afternoon or evening on a Friday might be attractive. It was suggested that many people might wish to stay overnight if it were a two-day event; previous stallholders had been canvassed, of whom around 75% would support a two-day event; there was plenty of accommodation on site or nearby; an evening social function could be arranged. Having taken account of all the views expressed, the Officers decided to contract for a two-day event. Tower Stewardship Committee - recognising the important role of this new Committee, an interim report was presented in October, with particular reference to the meeting of Committee members and Council Officers with the Ecclesiastical Insurance Group. Basis for charging subscriptions - in response to a query raised, a paper had been produced with two suggestions for a basis. The first basis bore a much closer relationship to the size of a society than at present and in this way the subscription could be seen as the contribution of individual ringers to the work of the Council. However, since there had been no formal request from the Council for a change, a Motion would have to be presented, if the matter was to be taken any further. Terms of Reference and Structure of Committees - in order to assist consideration of this matter, the Secretary had circulated comments from the Consultation Process of 2001, which suggested four groups of committees: no action had been taken on that proposal at that time; although several members felt that the Administrative Committee was too large, there was no agreement to take action on the proposals of 2001, nor was it felt that the Council wanted a wholesale review of structures. It was agreed that the matter be discussed with Laith Reynolds, who had proposed the Motion. At the outset Laith had queried the Minute recording his proposal for a motion on the structure of committees; while the Secretary had acknowledged that he could have added from his notes “for example, the Redundant Bells Committee could be handled by stewards not a full committee”, the general feeling of members was that the Minute was correct; had there been a specific request to review the Committee for Redundant Bells, members of that committee would have objected. What became clear from the meeting with Laith was that he also did not expect a review of the whole Council committee structure. It was felt that there was a need for guidelines for committees; sometimes committees were criticised; the Council expected to see some items included in committee reports, without a rigid adherence to the Terms of Reference. A draft set of guidelines was circulated: it was thought that the guidelines were a good idea which could be adopted by the Administrative Committee and given to Committee chairmen. The guidance should encourage committees to tell The Ringing World about their activities: once a year for the Council meeting was not enough, the paper welcomed small and frequent items. It was agreed that more time was needed to consider the draft which would be reviewed in October. Ringing Alliances - the Secretary had invited the two Societies to submit articles about their activities to The Ringing World: an interesting article about the Geldrop ringers appeared in the 24th November issue; a response from Transvaal was still awaited. Other ways of developing the Alliance were being explored. The Council and quarter-peal ringing - the Peal Compositions Committee had responded well with appropriate compositions to be published on a regular basis and the 2007 Diary had new compositions. There may be a Motion to the Council, which would give an opportunity to debate the matter and reach agreement on the principles, before referring any detailed work to a committee. Working group to examine the recording of peals - it was reported that a position paper had been prepared to be discussed with Bill Hibbert: it was hoped to present this to the October meeting of the Committee. Proposed Ringing Foundation - a working group was set up to respond to a possible private donation to support work in the interests of the future of ringing (other than bell restoration). The group comprised the President and Vice-President and representatives from each of the Education, Public Relations and Ringing Centres Committee, namely Roger Booth, Gail Cater, John Harrison, Simon Linford and Judith Rogers. The group looked more broadly at the issue of how funding could contribute to aspects of ringing including public awareness, recruitment and training. The group explored ways to spread good practice, especially ways to support initiatives at local level. One conclusion was that a Ringing Foundation, similar to those that exist for many other sports and pastimes, could act as an umbrella, able to seek and receive donations and other funding, and to make money available as grants to support a wide number of both local and strategic projects. A Motion would be put to Council proposing the formation of a charitable Ringing Foundation, at arm’s length from the Council itself. This would be a first step to support the more significant task of changing expectations, and achieving greater levels of activity in these important areas. English Heritage - meetings had taken place on 12th October 2006 and 5th March. CCCBR representatives had congratulated Graham Pledger on his excellent article on survey recording techniques published in The Ringing World on 15th September. Concern had been expressed at the possible implications for ringing of some recent legislation: EH felt that there was no likelihood of exemptions for churches: a view should be taken in each circumstance and a risk assessment undertaken. There had been no progress on the part of EH in producing a model specification for surveys of existing bellframes. The effect of EH’s initiative “Inspired!” to draw the attention of Government to the need of finance for church repairs would not be known until the result of the next comprehensive spending review was known - possibly by September - but it was thought unlikely that there would be any increase. Moves on Ecclesiastical Exemption were linked with the Heritage White Paper recently published, which would be open for consultation for 3 months; there would be new designation documents describing a church, its churchyard, any listed memorials, but at present there was very little about contents and fittings, certainly no mention of bells and bellframes. Problems with several rehangings had prompted EH to be asked to recommend how steel beam-ends should be built in; EH said that each case had to be considered separately but it would list the factors to be considered. Council for the Care of Churches - at the meeting held on 18th October the main item concerned the new criteria for listing bells: Alan Frost, who had been a member of the working party, spoke of the constructive discussion; terminology had been changed to “bells of historic significance”; bellframes of similar note were also now included; a Corrigenda to the Code of Practice was published in The Ringing World issue of 3rd November. Legislation was in progress to revise the Pastoral Measure, one result of which would be a new body to inherit the functions of the Advisory Board for Redundant Churches and the CCC. CCC reported that a new quinquennium for the Council had started in June, with fresh appointments of Conservation Committees: details of membership of the Bells Committee were given in the 10th November issue. The Council and The Ringing World - following an examination of the reserves policy of The Ringing World Limited, the Board had expressed a willingness to support specific projects to be undertaken by the Council or its Committees, provided that such projects could also be used to market The Ringing World to potential subscribers. As announced at the last meeting of the Council, all committee reports are being produced in a special issue of the paper, further copies of which are available to promote the Council and its work. This year at least three dioceses - Chichester, Manchester, and York - embarked on major reviews of their pastoral provision, clearly affecting numbers of churches with bells. St. Peter, Brighton is a case in point. While the Church Commissioners anticipate numbers of churches declared redundant under the Pastoral Measure settling at between twenty and thirty a year - twenty one in 2006; nine in 2005 - they acknowledge that such reviews could make major differences. For the record, by the end of 2006 the total number of redundant churches had reached some 1717. Redundant churches either find alternative uses, or pass into the care of the Churches Conservation Trust, or are demolished. 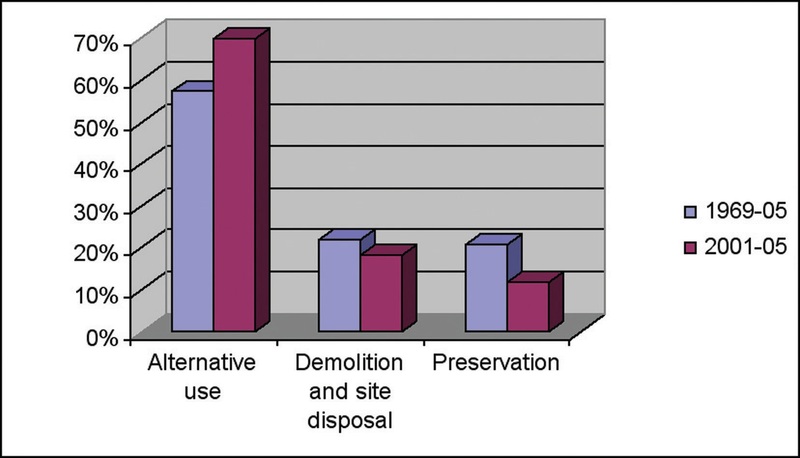 Since 1969 the proportions have remained fairly steady at about 2:1:1; but now the figures suggest that more buildings are finding uses and fewer are being preserved or demolished, as the accompanying bar graph shows. New legislation has made the redundancy process a little simpler. From January it has been possible to provide under faculty for part of a church to be used for something other than worship, whereas previously it was necessary to declare that part of the church redundant. A cheering development during the year was the launch of English Heritage’s Inspired campaign, aimed at pressing the government to do more to tackle the backlog of repairs to historic places of worship. It covers buildings of all denominations, and if successful should have some effect on redundancy numbers, though competition for cultural funds for Olympic purposes may overshadow it. Interesting cases during the year included the modern partner of the very ancient bell at Claughton; two bells in a derelict church in Hertfordshire; a bell apparently missing from a chime at a school; and a centre for a clock and bell project. We also - because it has become clear that not everyone realises that the Committee for Redundant Bells and the Rescue Fund for Redundant Bells are the same people - note that the Rescue Fund has been particularly active this year. It is a special pleasure that the Fund is currently helping to support the provision of bells at Wickersley, a project closely associated with Jeff Kershaw, a member of the Committee, who sadly did not see the project come to fruition. As promised last year, updated lists of churches affected by redundancy from 1969 to the present have been provided to the associations. Work to add to the lists full details of the bells in all the churches is continuing. We are considering how earlier notice of redundancy proposals could reach the associations, and are seeking to follow up the enquiries beyond the Church of England made by Philip Watts, immediate past chairman. Finally, we note with pleasure the progress made by the Committee’s “godchild”, the proto-National Bell Register, and include a summary of its present coverage by Church of England diocese. We record our thanks to the Council for the Care of Churches, the Advisory Board, and the Church Commissioners, with particular gratitude to Mrs. Dawn Christmas, our contact at Millbank, who retired during the year. The Keltek Trust goes from strength to strength: we thank David Kelly, consultant to the Committee, for his help and interest. The Founders Prize continues to be organised as before and in 2006 the sixth such prize was awarded. The Founders Prize for the Encouragement of Young People was awarded for the second time. Several enquiries about setting up new ringing centres have not yet borne fruit, but support for existing ringing centres has been strengthened. The Committee has been working with other Council Committees in the development of ideas for the proposed Ringing Foundation. The Founders Prize for the Ringing Centre which made the greatest contribution to the teaching of ringing in 2005 was awarded to Shiplake Ringing Centre. The £500 prize and a bronze plaque was presented by the Master of the Worshipful Company of Founders. The judges in this competition were Martin Bright, Gail Cater, Alan Frost, Norman Mattingley and Tony Smith. The other contenders were Aston Clinton, Barrow, Bradpole, Braunston, the Gordon Halls Centre at Eckington and the Troyte Centre at Bampton and Huntsham. The second winner of this prize was the KIDS.RING.OUT project from the Llandaff and Monmouth DA. This prize is also given by the Worshipful Company of Founders. There were also entries from Shiplake Ringing Centre, Tewkesbury Branch (Gloucester and Bristol DA) and Bishop Ramsey School, Ruislip. The judges in this competition were Andrew Gillett, Paul Hunter, Simon Linford, Norman Mattingley, Derek Sibson and Stephanie Warboys and again the prize was presented by the Master of the Worshipful Company of Founders. This competition is not specifically for ringing centres but for convenience is managed by the Ringing Centres Committee. Roger Booth and Gail Cater have been involved, along with the Education and PR Committee, in the President’s Working Group looking at recruitment and training. This has developed the proposal for a Ringing Foundation, details of which are reported elsewhere. During the year the Committee set up a stewardship scheme to support ringing centres. Each Committee member has contact with a number of the ringing centres to offer support and a point of contact. The Committee benefits from being more aware of what is happening at ringing centres. So far the scheme seems to be successful. The Ringing Centres Conference provides a useful opportunity for existing and prospective ringing centres to meet and discuss matters of mutual interest, and share ideas for “best practice”. The conference planned for November 2006 was postponed until March 2007 because of difficulty in arranging speakers. The event has the theme “Moving forward” and includes a number of presentations on current training issues, including working with young people. The 2003 Ringing Centres Conference highlighted the need to develop the network of ringing centres so that they were more widely available. Eventually we would like to see a network of several hundred ringing centres. Since the completion of the £50,000 Founders Award scheme it has proved difficult to make significant progress. In the past year the Committee has been in communication with seven contacts who enquired about the possibility of setting up ringing centres, but so far none of these has progressed to Council recognition. In order to help increase the number of ringing centres, a meeting with Centre Managers held in October 2004 identified the need for the Committee to offer much more in the way of practical support. This would encourage more ringers to set up Ringing Centres. One idea, which was enthusiastically endorsed, was to develop a package of training material which made use of the internet. This would include material specifically written for use in a web browser, as well as video clips and video material on a series of DVD’s. Material in this format would help make ringing “cool” again for young people. The material would be developed not just for use in Ringing Centres, but as the aim was to raise the profile of Ringing Centres, this training material would have widespread use. Much of the Council’s current output for beginners is paper based and there would be significant implications, including an overlap with the work of several other committees. There would also be a need for external funding for website design and to help produce DVD’s. A pilot DVD was produced in 2005 and discussions have since taken place with various committees, particularly the Education Committee, on how this project might proceed. With the offer of external funding and the establishment of the President’s working party on recruitment and training, it seemed sensible to place the project on hold pending the working party’s report. The proposal to set up a Ringing Foundation would, if implemented, help provide a vehicle to raise the necessary funds to help develop this exciting package, provided that the various committees that need to be involved are in agreement. It was agreed at the committee meeting held at the beginning of 2006 that a pilot scheme should be used to test the main questionnaire. Questionnaires were sent out early in the year and returned over a few months! At the committee meeting held in September the questionnaire was refined to reflect the comments made. Although there were one or two towers that felt that such questions as asking the ages of ringers in ten year age bands and how old ringers were when they learnt to ring were intrusive, in general the comments were positive and some very useful feedback was obtained. Since then the pilot questionnaires have been analysed and the results are proving to be very interesting. There is on average 1.51 ringers per bell. 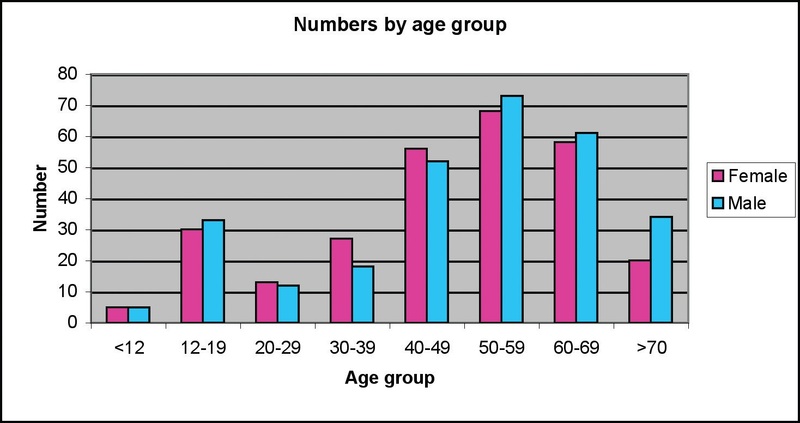 In particular, the results from part of Surrey show that only 13% of ringers fall into the 20 to 40 age group and 75% of ringers are over the age of 40. Compare this to the sample survey of the whole country carried out 20 years ago when 50% of ringers were under 40 and 50% over 40. For those over 50, there are now slightly more male than female ringers, under 50 the reverse is true. 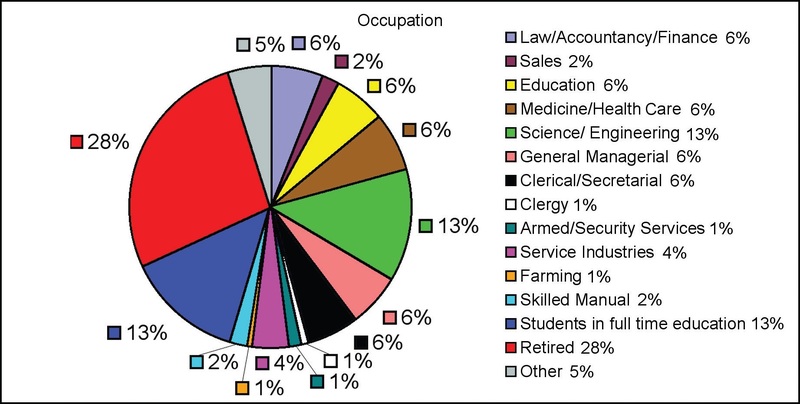 The analysis of occupations shows that by far the largest proportion of ringers say that they are retired or full time students (over 40%). Of those in paid work the largest single category (of 12 categories) identify themselves as working in science or engineering. The attached charts illustrate some of these initial findings, although it is stressed that this is very much interim data based on a small pilot sample. A phased programme is planned to collect data from the United Kingdom and Ireland and then from the rest of the World. There are four phases and it is planned to complete the fourth phase by the end of 2008 with the intention of presenting a completed report in 2009. During this period it will also be decided whether any further data collection is necessary. Where possible we are matching Societies with counties and Phase 1 questionnaires are being sent to Wiltshire and Dorset, Bedfordshire, Cambridgeshire, Cornwall, Durham, Tyne and Wear and Northumbria. Ireland, Kent, Northamptonshire and the West Midlands. Societies are being asked to help by providing a coordinator to assist with the data collection and inputting it into an Excel spreadsheet. Phase 2 is planned to start in June 2007 with Phase 3 following later in the year. Notice will be given in The Ringing World at the start of each phase. Data from the 2005 Roadshow questionnaire will be presented at the Council meeting. Two members of the committee have subsequently decided to stand down because of other pressures so we will be looking for two new members for the committee at the Council meeting in May. The Committee met three times during the past year, twice at Evesham and once in Loughborough. Our principal work has been inspections of towers and bell installations for PCCs, and giving advice on all aspects of bells and bellhanging. The Committee continues to pursue its aim of being an independent bridge between the professionals/trade and ringers, and to offer a wide range of expertise. The Committee contributes a member to the Council’s liaison group that meets twice-yearly with English Heritage and with the Council for the Care of Churches. A member also attended the inaugural liaison meeting with the Ecclesiastical Insurance Group in August. Our tower monitoring equipment remains at the forefront of this type of measurement technology. Three towers have been monitored: St Michael’s Cornhill, Sapcote and Halewood, in addition to the demonstration of the equipment at St Margaret’s, Leicester, at the 2006 Council Meeting. The new-found ability to monitor movement in each wall simultaneously does, however, continue to demand some time for research and development. To this end Ludlow has once again been used as an excellent test bed, to eradicate some minor bugs in the equipment and to investigate more unusual modes of movement. The equipment and the experience of using and interpreting it have together reached the point where it can earn its keep and a queue for its services is beginning to form. Monitoring surveys undertaken by the Committee are free, except for payment of reasonable expenses and insurance cover, but in consideration of the large financial outlay that has been required to produce the equipment, we do invite towers to make any donation to the Council if they feel able. The growing importance of the equipment was demonstrated by its use at Sapcote, where ringing had been curtailed due to increased movement of the weathercock following work to the spire that initially restored ringing. A professional company had been engaged by the church to undertake tests on the spire, but the results were inconclusive. The Committee was asked to check the movement with our monitoring equipment movement. Our measurement found the spire oscillated at a frequency below the measuring range of the professionals’ equipment, hence their inconclusive results. Sapcote PCC demonstrated their gratitude with a significant donation to the Council for this service. To meet demand for tower monitoring measurements, some further equipment kits are being produced. One of these will provide a second unit for the Committee. One is likely to be purchased commercially. The advent of a new generation of radio telephone transmitter equipment and the requirements of the licences issued to install quickly is probably the reason for the recent rise in requests for advice from ringers in how to combat this invasion of their space. This is a situation that is generally at odds with the will of the PCC, which is looking at the benefits of installation in a different way. The Committee does publish advice on this aspect on the Council’s web-site, and this focuses on the effects on an installation if this comes about. The situation normally starts well before this stage, however, where the ringers discover the PCC is minded to have such an installation, and are alarmed by and are against the proposal. The advice to ringers in such instances is to stay calm, and tell the PCC they are against the proposal, but that they wish to be part of the negotiating machinery in helping to achieve an installation which is non-damaging to the bell installation. By taking this action, rather than walking out en-masse, it is to be hoped the ringers will be judged by the PCC to be able to contribute to the proceedings. A cash-strapped PCC may find the radio transmitter income more useful than bells on Sunday. The installation at Rowley Regis, where the radio equipment is housed in a small building outside the base of the tower and is connected by cable to the aerial in the top of the tower, is cited as an achievable example of ringers, PCC and telephone company being completely happy. Although the overall responsibility for coordinating Health & Safety issues for the Council’s activities transferred to the new Tower Stewardship Committee after the 2006 Council Meeting, the Towers & Belfries Committee does still receive and consider H&S issues that are specific to towers and belfries. We pass on our deliberations to the TSC. A request to inspect the perceived vagaries of the bellframe at St Andrew’s Cathedral at Sydney was undertaken by a member while on holiday there. This led to an eventual report that included “round-table” advice in Committee. Its recommendations were such a close match with a report sourced locally that it promptly caused the cathedral authorities to award the ringers A$50,000 (£20,000) to undertake the work! The Committee continues a willingness to run courses on belfry maintenance. Only one was requested in 2006, but two in 2007. The Committee’s web-site continues to display useful data and documents. This includes the annually updated Ringable/ Unringable Towers table, which is our contribution to the Ringing Trends Committee’s monitoring work. In April Arnold Smith leaves these shores to live with his daughter in New Zealand. We thank him for his time with the Committee and wish him well for the future. He takes with him a first-hand knowledge of our operation and an understanding of the tower monitoring technique. so we expect our “trade” in that part of the world to increase! This is the first report of this Committee to Council. We comment on work carried out so far and planned for the next year. It has been increasingly obvious in recent years that bell ringers cannot exist “in isolation”. There are a number of external factors that now impinge on the activities of ringers. As such we must be aware of these factors, able to effectively communicate with the relevant authorities and able to manage these factors to the benefit of ringers. The committee is collating and assembling information relating to the above issues, some of which have been subject to recent discussion in The Ringing World. It is the aim of the committee to disseminate this information to all towers in the country as a set of leaflets in a pack, via the territorial societies affiliated to the Central Council, as well as putting them on the Council’s website. We have near-final drafts of these leaflets and at present are looking at seeking sponsorship to help with the production and distribution costs. We have decided to use leaflets and the internet to distribute the information for ease of updating. We have surveyed affiliated societies and found that most respondents asked if updates could be made available via the Council’s website. Senior members of the Council, together with representatives of this committee and the Towers and Belfries Committee, held a liaison meeting with Ecclesiastical Insurance. A full report of this meeting has been published in The Ringing World. One of the major items that came out of this discussion, and has been recently highlighted by a number of letters to The Ringing World, is the need for ringers to have full and proper lines of communications to the authorities who own and are responsible for the church buildings and the rings of bells, i.e. in most cases, incumbents, Churchwardens and PCCs. We cannot afford to hope that any request from the authorities (such as for CRB checks to be carried out) will just “go-away”, and it is in ringers’ own interests to co-operate. The committee is now working on obtaining funding for, finalising and distributing the leaflets. At this point we will review both any further work immediately needed and whether or not to recommend to Council in 2008 that the Committee should continue. We are currently of the view that the leaflets will need review and updating in the light of any comments received, but we are not yet convinced of the need for the Committee to exist permanently. It is clear that there will be a need for permanent liaison with Ecclesiastical Insurance, and possibly other bodies, but there are other ways this could be achieved. The Committee met three times in 2006; twice in London - in February and October - and at Leicester during the Central Council weekend. We started the year with one vacancy on the Committee, which was not filled at the 2006 Council, and during the year our number dropped to eight, following the resignation of Andrew Gordon due to pressure of other commitments. There is no doubt that this depletion in our resources has restricted the scope of the work we have been able to undertake. Nevertheless we were pleased to be invited to compile the 2007 Ringing World Calendar which features towers supported by the Bell Restoration Committee and the Keltek Trust. Putting the calendar together required a significant input from three of our members and we feel that the finished product does justice to their hard work. We must also thank the many contributors who provided words and pictures. As forecast in last year’s report to Council, the new edition of Organising a Bell Restoration Project was on sale during the Council weekend in Leicester and a copy is included in the fundraising pack which is sent to all parishes who seek advice about fund-raising for a new project. We are hoping to be able to fill our two vacancies at this year’s Council and would particularly welcome new members with time, enthusiasm and relevant experience. In March 2006 guidelines on the new rules for Gift Aid and Tower Open Days were written and published on the Council’s website and in The Ringing World. We continue to receive a steady stream of enquiries from parishes either involved in or contemplating bell restoration work. In all sixty-seven separate parishes or projects contacted the Committee during the year. Forty-one groups or individuals were in contact with us seeking advice and assistance with fundraising. Thirty of these were “first-time” enquiries - fewer than in 2005 - from 19 counties in England, one in Wales and one in Ireland. We received thirty FunderFinder enquiries and made searches on behalf of seventeen projects. In order to be able to offer advice that is as up to date as possible we devised a Feedback form that was sent to parishes soon after they had completed their projects seeking information on grants they had been successful, or unsuccessful, in obtaining. The response from parishes has been excellent and we are hoping to be able to build up a useful picture of where bell restoration funding is really coming from. The Committee assists the Manifold Trust by the provision of administrative support. The Trust offered seven grants totalling £29,500 during the year. Sadly, the Trust has advised us that, after the amounts it has currently set aside for grants have been allocated, no further grants can be made. For many years the Trust has made grants in excess of its income believing that it is better to meet the present need of other charities than to reserve money for the future. Over a period of some 25 years the Trust has granted over £600,000 to bell restoration. We are extremely grateful for the wonderful support that the Trust has given to the restoration of very many unringable rings of bells. There was not enough money in the Central Council Bell Fund to permit us to invite grant applications during the year. South Africa: Fourways Gardens, Johannesburg - £421; Greyville, Durban - £500; North America: Rochester, NY - £2,750. We will continue to review the contents of the booklet Organising a Bell Restoration Project, particularly the Appendices, and will update and re-issue as and when needed. We will also review our work on the advisability or otherwise of registering entire guilds as charities in the light of changes to taxation effective from April 2006. It is still our intention to explore the possibilities of seeking practical advice from professional fundraisers but work on this is not proceeding as fast as we had hoped - mainly due to our current lack of human resources. The Committee met twice during the year: on July 9th at Ledbury and on October 15th in Derby. It is pleasing to report that very nearly all of Tom Lock’s hand-written notes have been put on disc. It is less pleasing to note that very few Council members and former members have taken advantage of the opportunity to down-load forms from the Council web site and to submit completed forms. It is seriously disappointing that some very prominent Council members have never taken the trouble to complete a form; conversely some members have taken a great deal of trouble to provide very complete details of their ringing careers - our grateful thanks are due to them. A few statistics might indicate the size of the problem faced by the Committee. There are 454 past members still living. Of these 111 have completed a biography form this century. 236 have completed a form in the 1900s. 107 have never completed a form. There are 237 current Council members. 50 completed a form in the 1900s and 35 have never completed a form. Members of the Committee have written many letters and sent even more emails during the course of the past year inviting Council members to complete forms. When a member or former member dies, then it is expected that details of that person will be read out at the Council meeting and published in The Ringing World. If the deceased member has never completed a form, then it can be extremely difficult, not to mention time consuming and expensive, to try to find out, for example, what the initials in that person’s name stood for. The writing out of present and former deceased Council members’ records is a continuing task. The committee met three times at Wellesbourne. There are eleven members for twelve places. Courses - The committee delivered three courses (two on listening and one on bell handling). We are reviewing the content of our main course on teaching and tower management. We are also seeking to stimulate demand for this, which has reduced in recent years. We are in discussion with the North American Guild about how to transfer the course for local delivery. Simon Linford set up a scheme to provide long term mentoring for people wishing to develop conducting skills, with mentors and students interacting by e-mail. Analysis of feedback from the initial batch of students is generally positive. Publications and resources - No new publications were completed during 2006, but work progressed on The New Ringer’s Book, pilot copies of which should be in use by mid 2007. A new book by Pip Penney, Teaching Unravelled, draws on the results of research into how people learn, and applies it to ringing. It will be published in 2007. Pip Penney and Heather Peachey made progress with the “Tower Captain’s Resource”, a collection of practical resources to help tower captains run varied, stimulating and effective practices. Simulator - Loan of the simulator continues, but at a low level. The simulator may be borrowed for evaluation, or for training courses, by contacting Heather Peachey. Network for Ringing Training (NRT) - Membership is approaching 500, with the discussion list used by about 60% of members. Indexed summaries are made available to members by e-mail (or post for members without e-mail). Our thanks go to Alison Barnett, who has produced most of the summaries over the past five years. We are seeking someone to compile future summaries. Thanks also to Richard Barnett who provided web and bulk e-mail services for NRT. We are in discussion with the ICT committee about hosting these services on a Council server. Framework for Training Ringers - The Framework was revised in response to feedback from pilot users, and presented at the Open Meeting at Leicester. It is available for download from the committee website. Affiliated societies have been asked to promote it. Ringing Foundation - The committee played an active part in the cross-committee working group that led to the proposal for a Ringing Foundation. Future plans - The committee’s vision is to take forward the state of the art in ringing education and to help spread best practice to member societies and individuals by whatever means is most effective. The major new work undertaken by members of this Committee has been to identify and prepare a more flexible and cost-effective website server. This will provide the space and facilities not only for the Council website but also for hosting other ringing websites whose continuity is important to the Exercise. The new server is already hosting the Ringing Centres Committee’s Learn2Ring website and John Ketteringham’s Bell Recordings website, and discussions are under way with the Library Committee among others. The transfer of the main Council site is planned for Spring 2007 and additional application support for the NRT is under discussion with the Education Committee. In addition we have helped Andrew Craddock take over hosting of the Felstead data base by writing some software to tidy up inconsistencies in the data and also the production of some forwarding pointers from the old site. We continue to maintain most of the main Council website adding new content as required. Significant assistance has been given to the Lincoln Diocesan Guild in the design and implementation of their new website. Some of the experience gained from this exercise is already being applied to the Bell Recordings website and may in due course assist the future growth of the Council website. The Council Library is the major guardian of the written and to some extent oral history of ringing. Over the years it has gathered together the largest collection of change ringing historical texts in the world, better than the British Library or the Cambridge University Collection. The vast majority of these are in the form of books and other paper based items. The library is of course based in a building at a fixed location and to that extent is limited in the way in which these can be consulted. It has a complete run of bound volumes of Bell News, a predecessor of The Ringing World, which was published between 1881 and 1915 and which occupies several metres of shelf space. Hitherto consulting these required in most cases a long journey to the Library and searching through heavy volumes of the publication or else asking the librarian to undertake searches for enquirers. This will soon change. Every page of Bell News, including advertisements and notices will shortly be available on a DVD and perhaps by the time this report is published will be accessible via a comprehensive index, originally compiled by Cyril Wratten and prepared by Alan Ellis, also available on the DVD. During the past year committee members led by Paul Johnson have continued carrying out a thorough check for errors, inconsistencies, missing pages and appearance as well as cross checking indexed items that were ambiguous, as some page numbers occurred twice in many of the volumes among 27,147 of scanned pages. This has been hard, time consuming and often mind-numbing work. Inevitably and as expected many errors were discovered and corrected and also there were 152 missing pages from the original scans along with 218 pages which were of poor quality and merited re-scanning. Even so it is inevitable that “perfect” scans were not possible because of the poor quality of the original printing and the fact that the scans were carried out on bound volumes which could not be laid flat on the scanner. Inevitably the Bell News project has consumed much of Committee Members’ time. Nevertheless work is being carried out on the conversion of the Obituary Index into a fully searchable index which will be brought up to date with references from The Ringing World over recent years and will also include entries from The Bellringer and Campanology. Work has also continued on 18th Century newspaper extracts. As in previous years the Newsletter for The Friends of the Central Council Library has been prepared by John Eisel. These Newsletters have always been favourably received by “The Friends” over the years. In addition Dr Eisel has found time to list those Library items that have been added to the printed books section since the publication of the library catalogue in 2002. This amounts to 30 pages, compared to the original catalogue of 168 pages, illustrating the increased activity of the Library in recent years. It has also been a busy year for Library accessions with 99 new items received and catalogued and security marked. The Methods Committee held two meetings during the year, in Normandy (Surrey) on 12 March and in the City of London on 29 March. The definitive method collections on the Committee’s website (www.methods.org.uk) continue to be updated on a weekly basis. We are grateful to Julian Morgan for enhancing the independent checks that he regularly runs to include the summary tenors-together falseness which was added to the collections last year. A Supplement to Rung Surprise, Delight, Treble Bob and Alliance methods covering the methods rung during 2005 was available at the Council meeting and we will be preparing a further Supplement covering the methods rung during 2006. A document explaining the aims, objectives and high-level structure of the proposed XML specification, for exchanging method information between computer applications, is in preparation and will be made available with, what we hope will be, the final draft of the specification. Work has continued on the new edition of the Collection of Doubles Methods and we also hope that this will soon be complete. At the invitation of the Ringing World Office we proposed changes to the Minor, Royal and Maximus methods in The Ringing World Diary 2007. By using a mixture of diagram formats we were able to include more methods. A favourable review by A. J. Barnfield was published in The Ringing World (p.1065) and we intend to propose changes to the Major methods for next year’s Diary. As usual, we have answered many enquiries about methods, method names and method extension. The committee continues to produce regular pages of compositions for publication in The Ringing World. Selecting (and, at times, soliciting) suitable compositions has resulted in pages which have covered a wide range of methods and complexity as well as special themes, e.g. Queen’s 80th birthday. Pages have been published at a healthy rate of approximately one per month. In addition this year we have begun to produce Quarter Peal pages in response to requests from several parties. These have been generally well received and will continue to appear on an occasional basis. The committee also continues work on several new print collections. The Stedman Caters and Cinques collection and Handbell collection are nearing completion. Work on a new Spliced Minor Collection continues with the aim of bringing together old and new material in one volume. We have recorded a total of 4994 peals rung in 2006 and published in The Ringing World, of which 4345 were on tower bells and 649 on handbells. The revised total for 2005 was 4926 - making a small net increase of 68. The increase was due to an increase of 74 in the number of handbell peals compared to 2005. The number of tower bell peals has not changed significantly. Full details are included in the methods table that accompanies this report. The Oxford Diocesan Guild remains the leading society with 419 peals, followed by the Yorkshire Association with 322. Please see the separate table for details of peals rung for individual societies. The Committee met once, in February in Abingdon, to finalise records for 2006, to agree the format of the report and to discuss other issues. We have continued to be supported in our work by The Ringing World Ltd and we are most grateful to their staff, and especially to Bill Hibbert of the Ringing World board, for their various work in collating, editing and correcting the current peal data for The Ringing World and peals.co.uk, with which we cross check our data. We thank also those Society Peal Secretaries who have helped by comparing their figures with our own. Bamboo Enthusiasts Society, Frensham 27.6.2006, 5040 Plain Bob Minor (RW 14.7.2006, p668). Rung on Anklungs, a bamboo musical instrument, rather than on bells. There is an implicit expectation in the Decisions that peals shall be rung on bells so that, for example, peals tapped on handbells or performed on a piano would not be included in the analysis. We thank the Chairman of the Methods Committee for his continuing assistance to us in identifying such peals. A letter from the Chairman of the Methods Committee appears elsewhere commenting on corrections necessary for peals of Doubles to conform to reporting rules. All have been included in the Analysis. The accompanying table incorporates a summary of the more popular methods with an analysis of the year on year change in the numbers of peals rung on each number of bells. “Single Surprise” means the total rung in single Surprise methods other than those listed specifically; there are no methods in this category rung 20 or more times. An “Other” category is included for completeness. There were 166 first pealers in 2006 (185 in 2005) and 33 firsts as conductor (19 in 2005). We congratulate all those involved in these performances, particularly where several firsts were included in one peal. It is encouraging that the numbers conducting their first peal have increased significantly. Nevertheless, the numbers of first pealers are the lowest for several years. There are a number of alterations to the 2005 Analysis as detailed below, some caused by late submission and others by peals not being accepted by Societies. In addition, as reported at the 2005 Council meeting, the table of peals by Society contained 11 peals of Royal and 1 peal of Maximus in hand attributed to the London County Association which should have appeared for the Middlesex CA & London DG. The amended methods analysis for 2005 is shown in the 2006 methods table, which forms part of this report. Revised totals for 2005 are: tower bells 4351, handbells 575, total 4926. The Felstead database was moved on to a new server and is now maintained by Andrew Craddock. He has brought the backlog of peals up to date and is inputting new peals from data received from The Ringing World. Corrections to peal records continue to be received on a regular basis. For pre-1990 peals these are still made to the original files that were derived from photocopies of the Felstead cards. It is intended that soon all corrections will be made directly to the online database. At that point a decision will need to be made on whether to freeze and/or archive the original Felstead files. The committee has met four times during the year and conducts very regular discussion by email. An announcement has been made that the next Ringing Roadshow will be held at Stoneleigh Park Exhibition and Conference Centre, Warwickshire and will be a two day event on 5th and 6th September 2008. It has been decided to retain the name “Roadshow”. The organising team is led by John Anderson of the St Martin’s Guild for the Diocese of Birmingham and a past-President of the Council. It is planned that the style of the Roadshow will be changed to incorporate a range of new events to attract the general public as well as ringers from around the world. There will be a bellringers’ party on the Friday evening, and hotel accommodation is available at Stoneleigh as well as a range of bed and breakfast and hostel information available locally. Pictures of the Showground are provided, and for further information about the venue visit www.stoneleighpark.com. Work is in hand to extend the email network of public relations contacts around the country as well as the rest of the bellringing world so that publicity for the 2008 Roadshow will reach every belfry. To join this network please contact the Committee Chairman. 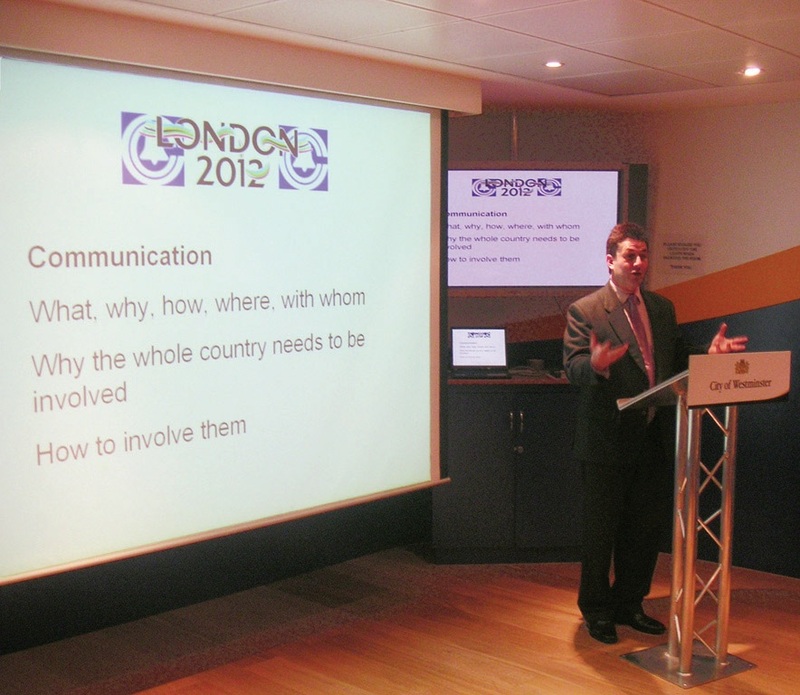 On 6th January 2007 representatives from all ringing societies operating within the M25 were invited to a presentation about making a case for ringing to be a part of the 2012 London Olympics (see photo). Tim Joiner, immediate past Lord Mayor of Westminster, has acted as a consultant to the committee in making this presentation and this work is acknowledged with thanks. The discussion is continuing through a Yahoo discussion group and is revolving around a concentrated recruitment drive so that the case can be argued that the Olympics coming to London has led to a big upsurge of interest in ringing and therefore that ringing should be represented at the Opening Ceremony as well as in advertising material and in the media. To join this Yahoo group email alan@chantler.net. A small working group from the Middlesex C.A. & London D.G., the Essex Association and Docklands Ringing Centre has been formed to develop these ideas and a further meeting of representatives of all London societies is planned for summer 2007. Once plans are in place for London ringing, then work will develop into promoting this in other areas of the country where Olympic events will take place. Building on the success of the 2005 Workshop, a second Public Relations Workshop was held in Melbourne, Derbyshire in October 2006. Guest speaker Viscount Raynham showed the BBC2 film “A Passion for Churches” and gave a presentation about spearheading the East Raynham bells project. Achieving publicity for ringing in the media was discussed and participants also had the opportunity to share experiences and ideas. The BBC4 TV series “Marcus Brigstocke’s Trophy People” opened with an episode about bellringing. It followed the Masters of the ASCY and Birmingham bands as they prepared for and rang at the National 12 Bell Striking Contest at Worcester Cathedral. In February BBC Radio 3 featured the ringing at Crowland Abbey in an episode of “Music Matters” which explored Lincolnshire traditions. Much other media coverage has taken place during the year at the initiative of local ringers. Of particular note are the Essex Association’s peal for the 60th anniversary of BBC Radio 4’s “Woman’s Hour” and the Southwark Cathedral band’s appearance in the Queen’s Speech (produced by ITN) on Christmas day. Over the year the committee has collated up-to-date information on university societies for www.cccbr.org.uk. This has also been published in The Ringing World and on www.ringing.info/. It is now considered to be easily accessible. The information is under review to ensure it remains current. Updates and information should be sent to prUniInfo@cccbr.org.uk. Articles were produced promoting student ringing in The Ringing World during the summer of 2006 (and more are planned for 2007) and contact has been made with the Northern and Southern University Associations asking about further help and support which may be required. Complaints Helpline: There have been seven requests for advice to the Complaints Helpline during the year, including one about the electronic bells at Los Angeles, California - which is beyond the remit of the Council! Contacts for complaints are available in the diary and on www.cccbr.org.uk. General advice was given in The Ringing World about the sensitivity of ringing during the two minutes’ silence on Remembrance Day - which in 2006 fell on a Saturday. An outline database of contacts of societies affiliated to the Council is now available to council officers and chairmen. Ringing was encouraged to celebrate the 80th birthday of HM The Queen, and there was a very active response. Ringing was also encouraged to celebrate the 125th anniversary of The Children’s Society. Groups around the country were successful in raising money for The Children’s Society and at the same time gaining local publicity for ringing, especially of young ringers. A reprint of a further 50,000 Ringing Publicity Leaflets has been made and leaflets are distributed on request by email to leaflets@cccbr.org.uk Further information and telephone contacts are available on www.cccbr.org.uk. Requests vary from between 1 and 1000 leaflets and approximately 60,000 have been sent out since the launch in September 2005. Work is in hand to design a publicity poster in the same style as the leaflet and it is anticipated that this will be ready for production during the summer of 2007. Work has continued in responding to requests about where to go to learn to ring. These are received via www.ringingworld.co.uk/learntoring/ and an individual response and local contact information is given. “Learn to Ring” is continuing to gain response from returning ringers as well as new recruits. A library of photos of bells and ringing is available to download. The work of Richard Offen (acting as a Consultant to the Committee) and Peter Trotman (CC Webmaster) in developing this is acknowledged. A CD including a talk about ringing and the library of photos is being prepared and will be made available for sale. Peter Robson has been co-opted as a member of the committee with a specific remit of developing links with and publicity about university societies. Only two new publications were produced during the year. They were The Learning Curve 3 and Rung Surprise Supplement (to end 2005). Sixteen titles were reprinted: Beginners Handbook, Towards Better Striking, Doubles and Minor for Beginners, Ringing Circles, Ringing Skills, Listen to Ringing CD 1, Listen to Ringing CD 2, Beginners Guide to Change Ringing on Handbells, The Tower Handbook, Learning Methods, A Tutors Handbook, Kaleidoscope Ringing, Towers and Bells Handbook, Organising a Bell Restoration Project, Splicing Bell Ropes, and the DVD. Bookbinding techniques have improved recently and as a result we were able to reprint the Towers and Bells Handbook with a soft cover and to advertise it at the old price. It is a high quality book and has been well received in its new form. Bulk discounts were offered in March as usual and advertisements were again placed in a number of Society reports. Our main supplier continues to give excellent value for money, to respond quickly and efficiently to our requests, and to provide high quality cover designs. However, we continue to test the market regularly. The recent changes to postal charge rates have, on balance, worked in our favour and have helped us to avoid price increases. We now offer The Tower Handbook as part of our discount scheme. Income from sales fell to £11,400 from £15,000 and the excess of income over expenditure fell to £750 from £3,500. However, the value of stock rose to £11,200 from £5,600. This situation was due in large part to the lack of major new titles, which sell well immediately after publication, and the large number of reprints, including two of the more expensive books, whose sales tend to remain at previous levels. Cash in hand fell to £3,500 and we did not feel able to offer a transfer to the General Fund at year end. As announced at the Leicester meeting we are giving attention to succession planning in respect of the storage and distribution work carried out so ably by Barbara Wheeler. There is no suggestion that Barbara will step down in the near future and we hope that she will continue for many years to come. However, her work is so vital to the business in its present form that we think it only wise to begin long term planning. This year the Committee was unable to recognise a potential record length as a consequence of the umpires’ report. Due to a shift in one doubles extent, rounds actually occurred after approximately 160 changes. Therefore, as this was not a true extent, the performance cannot be recognised as a peal. We would like to congratulate the ringers for getting to the end of the ringing, as it was the first peal attempt for five of the band, and they rang 12000 changes without anything official to show for it. Another query was also raised about a performance of 10560 Double Bob Major at Dore in 1980. Decision D.D states “Record Length Peals of 10,000 or more changes must comply with the additional conditions below. Any such performance not rung in full compliance with these conditions shall not be published in The Ringing World.” D.D(b) requires the peal to be heard and the composition checked by competent umpire or umpires. As this performance had no umpires, the Council was unable to recognise the peal, and as such it has not been published. In this case there is no reason to suggest the peal was not of a standard that could be recognised, and that it was a true performance. Working in conjunction with the Trustees of the Keltek Trust the Fund has provided loans to assist the Church Council of St.Mary’s Moseley in the purchase of the chime removed from the church at Cradley Heath, Birmingham to provide a new ring of bells at St Mary’s and to acquire four bells redundant from Highfield, Liverpool to provide a new ring of bells at St. Alban Wickersley. The Wickersley project is particularly gratifying as it is one that the late Jeff Kershaw had an interest in and would have been supportive of. £5000 from his bequest to the Council has been allocated to the Rescue Fund and has funded the loan for this project. The Fund had also been much involved in negotiations in the latter part of the year concerning the future of the eight bells redundant from All Saints Northampton, having been replaced by a new ring of ten. The Faculty authorising the removal of the bells required their use elsewhere but the PCC needed to realise the value of the bells to fund the project for the new ten. In order to ensure that the bells were available for future use elsewhere and that time could be taken to ensure the best project and to head off any attempt to vary the Faculty terms to dispose of the bells individually or to dispose of the bells for scrap the Fund was able to safeguard the bells by way of providing a loan to Northampton for a sum representing their discounted value. This could only have been achieved by the prompt support of those ringers who have undertaken to provide loans for the Fund and the Trustees of the Fund are immensely grateful to those individuals for such a quick and generous response. At the moment the only project for the bells is installation at Kalgoolie and it is hoped that it will become clear during the course of 2007 whether this project is viable. If not the Trustees will actively look for an alternative so as to ensure that the bells are not left in storage for any longer than necessary as well as, of course, to ensure early repayment of ringers loans. It is very encouraging for the members of the Committee for Redundant Bells, who are the managing trustees of the Rescue Fund, that it has been possible for the Rescue Fund to pay a crucial role in three bell projects involving bells that are redundant to ensure their re-use elsewhere. Members will recall that the Committee wishes to support the re-use of redundant bells generally, not just bells from redundant churches. It is to be hoped that more projects can be supported during the coming year. As always new promises of loans to be taken up if required are always welcome. The Accounts for 2006 are set out separately. The sum of £5000 from the J Kershaw bequest previously held by the Council’s main fund was used in making the loans noted above and is shown as a nominal receipt. The sum of £20000 shown as cash held in CCCBR account represents a promised loan which had not, by the year end, been paid to the parish concerned.